On Saturday, I rode the bus down to the Central Market (gosh, I go there a lot, don’t I. What can I say? It’s kind of awesome) and met up with my cooking teachers, Agnes and Istvan. We introduced ourselves and headed into the market to hunt down our ingredients: Beef, a pepper, a tomato, a bag of túró, some different kinds of local goat and cow cheese, sausage, bread, and wine. They also made sure to get me samples of everything, including fried goose skin (very popular here) and a new, fancier kind of túró rudi made with dark chocolate. 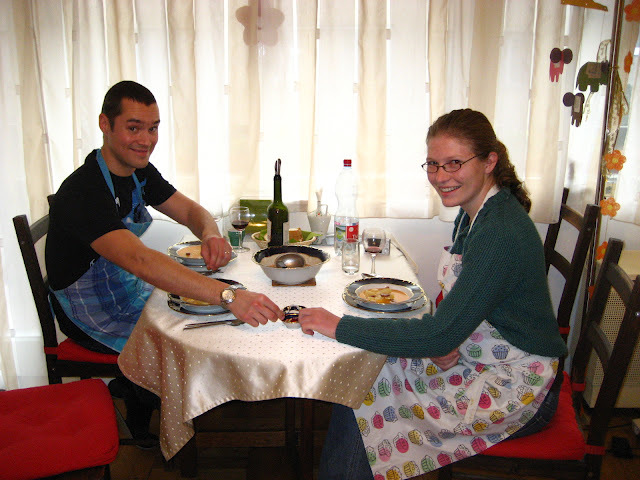 Back at their apartment (near Moscow Square, on the Buda side), we started to cook. 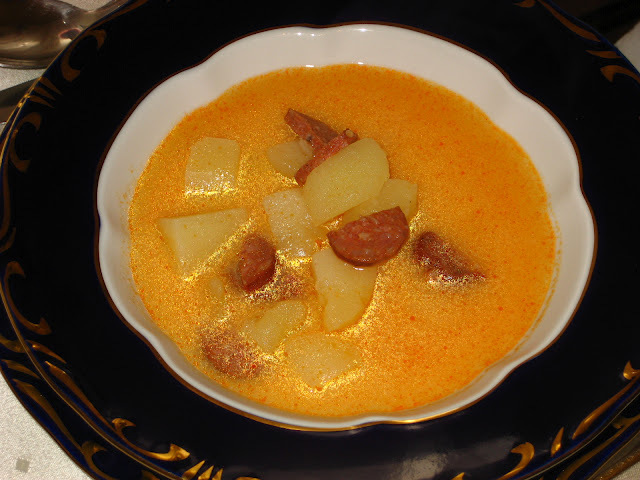 Almost every Hungarian dinner begins with a soup, so we made this potato-sausage soup. Peel, clean and cut the potatoes in medium size cubes. In a pan lightly brown the sliced sausage in 2 tablespoons of vegetable oil. When sausage is lightly browned and rendered of fat, add the cubed potatoes, bay leaves and 3 times as much water and cover. Keep boiling until potatoes are soft enough to cut through with a fork. Move off the heat. Roux: You will nead about 2-3 tablespoons of roux. Heat oil in a pan and add flour, stirring constantly. After 2-3 minutes, the roux will start to brown. Take it off the heat and keep stirring for a few seconds. Let it cool down and add red paprika powder (until bright red) and 2 tablespoons of sour cream. Add some soup liquid to the roux, mix well and pour it back to the soup pot and bring it to a boil. If you like it a little more sour, adjust with some vinegar. 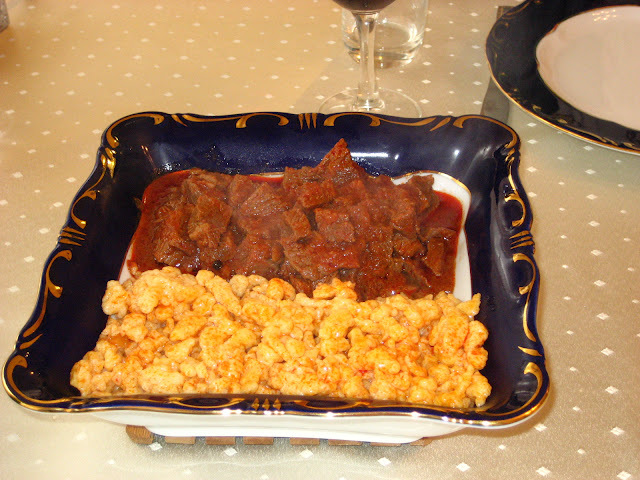 For the main course, we made beef stew and tiny dumplings. These are so good! In a large soup pot sauté onions in vegetable oil over low heat, stirring frequently, until translucent. Do not let them get burned. Salt it lightly to help tenderize them. The onion should be cut into very small pieces, which helps cultivate the “stew consistency”. Add a small amount of water, if necessary, to keep them from sticking to the pan. Remove the pot from the heat, add the sweet Hungarian paprika, stir, add the tomatoes, the sweet yellow pepper and the meat, and stir again. Do not burn the paprika, because it will get a bitter taste. Add the bay leaf, the peppercorns, some salt and water to cover by an inch and bring to a boil. Reduce heat, cover and simmer until meat is tender, about 1.5-2 hours, adding water, as necessary to avoid burning. Istvan and I reaching for the salt and paprika-essentials for any table. Beat egg, add salt, water and flour and mix together. Stir until you get an elastic moist dough. Boil water in a pot, and add some salt..
Place a nokedli grater (or a colander) over the pot of boiling water. Scoop a portion of the dough on the grater and move it back and forth over the grater using a spatula or wooden spoon. When the dumplings rise to the top of the boiling water wait about 30 seconds and then scoop them out. Serve immediately as they cool quickly. Dessert was cheese dumplings. These are not very sweet, and you can definitely add more sugar to them if you want. They do not keep, however, so eat them right away! This recipe makes about 9 dumplings. Separate egg yolks from the whites. Beat egg white until it forms stiff peaks. Beat the egg yolks with the sugar and vanilla. Place the cottage cheese in a bowl and crumble it or put through a sieve. Add the egg yolk and white, the semolina, lemon peel, and a little salt. Stir to combine. Let rest in the refrigerator for 20 min, so the semolina can absorb moisture from the cheese. In the meantime, toast the bread crumbs in oil, over a low heat until browned. Bring a large pot of lightly salted water to a gentle boil. Shape the mixture into 8-9 large dumplings in the palm of your hands. It is easier to do this if you moisten your hands slightly before touching the dough. Slide the dumplings into the boiling water and stir gently in the first minute, to prevent sticking. Reduce the heat and simmer, uncovered, until the dumplings rise to the surface.Remove the dumplings from the water using a slotted spoon, drain, and lightly roll them in the browned breadcrumbs. 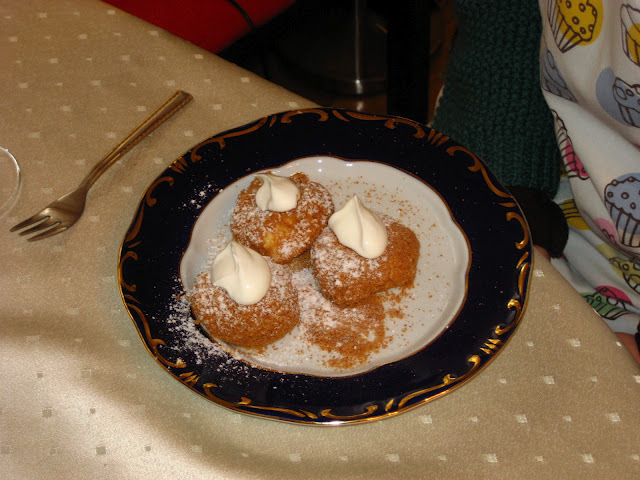 Sprinkle with powdered sugar and serve with sour cream. Anyway, the food was really amazing, and so were the teachers. They sent me a bunch more recipes, too, so I will have to try them all out. The best-looking one right now is called the Gundel Pancake, and it’s basically a crepe with walnut-chocolate-paste filling. As soon as I can find baking soda, that is definitely happening. I want to eat everything in these pictures. I will show you how to make it all when you get here! It’s so good. Me too! Please take another class! We will enjoy the goodness when you come home! Everything looks delicious! Be sure to list the Gundel pancake recipe when you make it. That sounds especially appealing this morning as we wake up to 18 inches of snow and no pressing need to be anywhere! Baking soda is ‘szódabikarbóna’ in Hungarian. You can find it in every supermarket (Spar, Kaisers, etc.). Usually the packaging looks like this: http://bit.ly/wX79U9 or this: http://bit.ly/ytt1cw. I am visiting with your parents at North Star. Gramma Ruth is here too. It is snowing and beautiful. I love your blog. I will share it with my kids. I think my daughter would get a big kick out of the Hungarian words. We are happily settled in Reno now. I am teaching piano to 3 students ages 7, 9, & 11. We are having a recital on the 18th. Mom is doing great. I wish I could keep up with her and all her activities. I am in two choirs and that is wonderful. I love it. I wanted to start school for my teaching certificate this Spring but the college and I have a difference of opinion about when my residency started in Nevada. oh well.